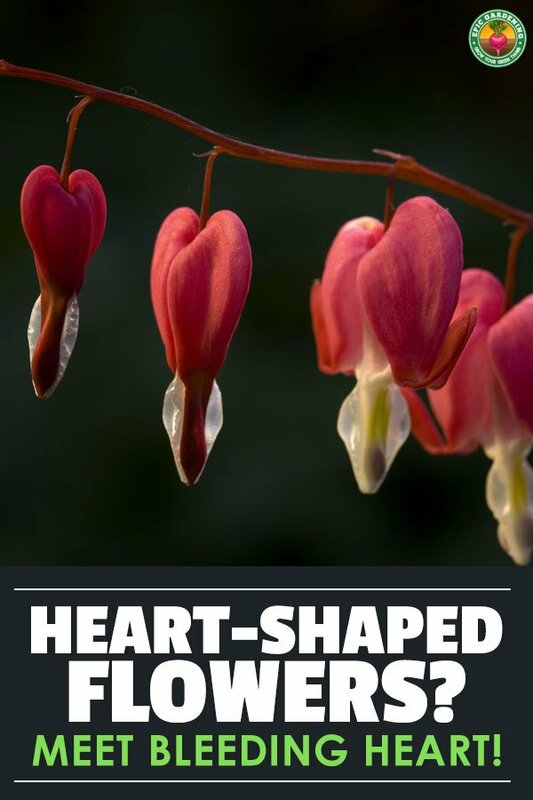 Ever wondered if there was a heart-shaped flower that you could give to your loved one? 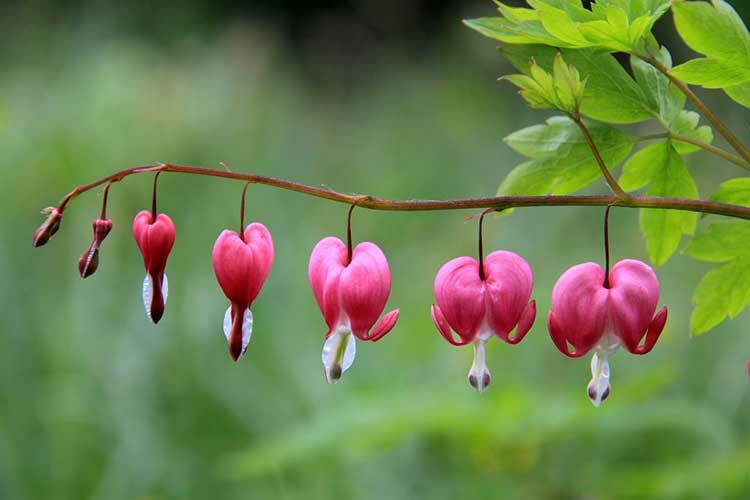 Well, look no further, because bleeding heart flower produces strings of up to twenty of them at a time! 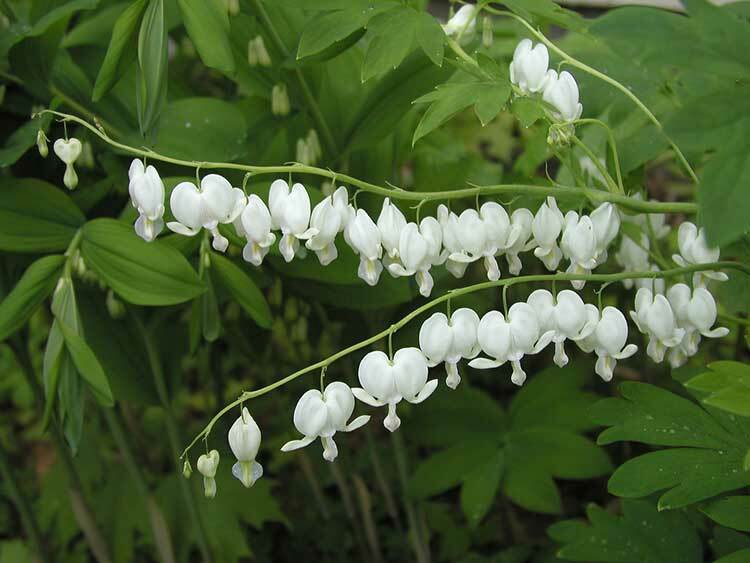 Dicentra spectabilis is now known officially as Lamprocapnos spectabilis. But it’s also referred to by its original taxonomical name. I’ll be referring to it as both in this piece, as the two names are synonymous. If that’s not confusing enough, it’s also called Cyanaeorchis spectabilis, Corydalis spectabilis, Diclytra spectabilis, and Dielytra spectabilis. But let’s keep it simple! 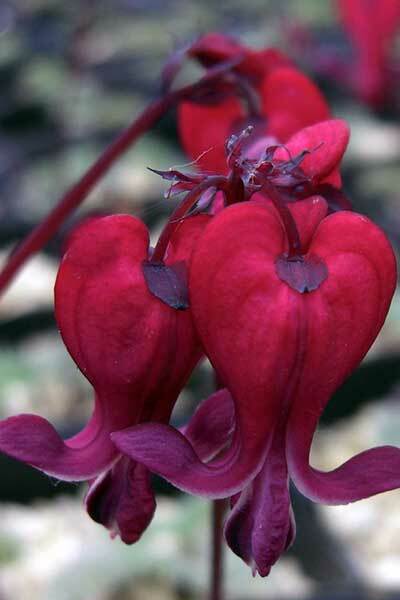 In common names, it’s referred to as Asian bleeding heart, lyre flower, and lady-in-a-bath. 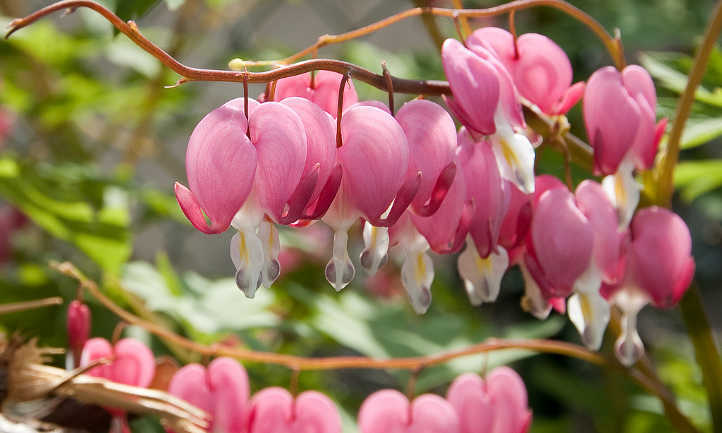 It’s popular because of its beautiful, drooping heart-shaped pink, red and white flowers. But how do you grow it? Is there a good way to harvest seeds from the flowers? Does it like sun or shade? And how do you encourage it to produce those unusual flowers all summer long? Want to know how to raise your own heart-shaped garden filled with love? Let me show you how! Pests Aphids, scale, snails & slugs. Also subject to fungal diseases. There are potentially hundreds of varieties out there. Different hybrids produce different flowering patterns. Some produce spread-out hearts along a long stem, where others produce flower clusters. We’re focusing on the traditional types today, but most hybrids are cared for exactly the same way. Both Alba and Pantaloons have white flowers, and they behave similarly. Pantaloons tends to be a bit more tolerant of direct sun, where Alba prefers full or partial shade. Both varieties are among the most popular ones commercially available today. 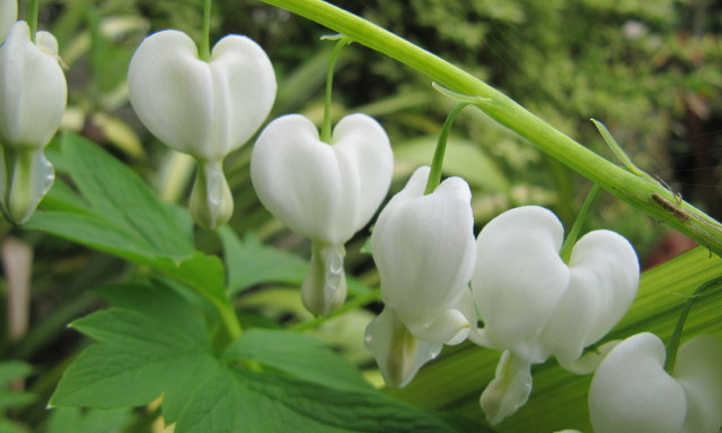 These create a white heart-shaped flower with white or cream droplets underneath. Gold Heart’s a bit of a misnomer for this particular variety, as the flowers are all rose-pink! The foliage is what gives this varietal its name, as it’s a vivid gold with an underlying greenish tinge. It makes a striking display in the garden, especially as it tends to be a larger variety with a mounding habit. This interesting varietal has grey-green foliage that springs from vivid red stems. It produces long sprouts of crimson heart-shaped flowers with tiny white-tinged droplets. This particular red-flowered-variety can be hard to find at times, as it’s a patented cultivar. But it is incredibly beautiful in a garden setting. This cultivar has blue-green fern-like leaves and pink-red heart-shaped blossoms. The tips fade into a purply-tinged droplet. Fire Island prefers full shade environments. It produces bright shows of color throughout the summer months. Did you want hot pink hearts? King of Hearts can provide them! This semi-dwarf variety produces vibrantly pink flowers that have a hint of white at the base. King of Hearts likes a dappling of sun in its shade, which makes them a great choice for part-sun locations. Burning Hearts is a dwarf varietal. It only grows to be around 10-12 inches tall at maximum height, and about the same width across. It has an extended blooming cycle, producing flaming red flowers throughout the summer. This red-flowered type is perfect for container gardening. Growing to a height of about 15 inches, the fringed bleeding heart leaf variety is also a dwarf cultivar. Native to the Appalachian mountains, it has delicate, lacy leaves which look fringed. Like Burning Heart, it does extremely well in containers. Overall, these plants are quite simple to care for. But there’s a few key things you should know about how to grow these plants. Let’s go into those in detail now! Some varieties appreciate lots of sunlight. But most prefer shade or partial shade. Zones 3-9 are ideal for these. 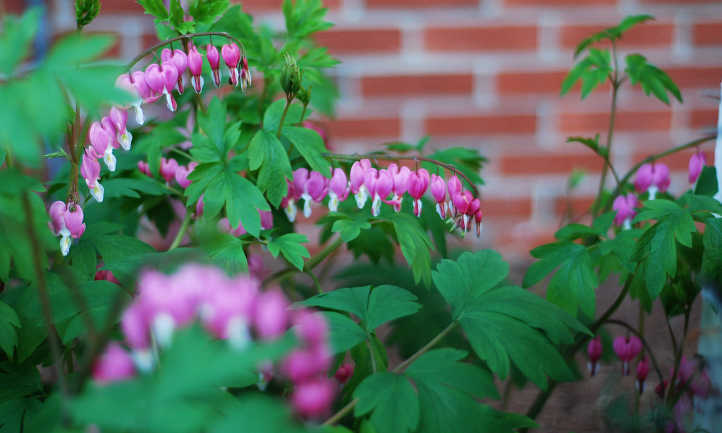 If you’re in the far northern United States, it may be possible to grow bleeding hearts in full sun. I still recommend tucking them under trees or bushes for a little protection! Growing in containers? Place the container in a location where it can’t get scorched by the afternoon sun. 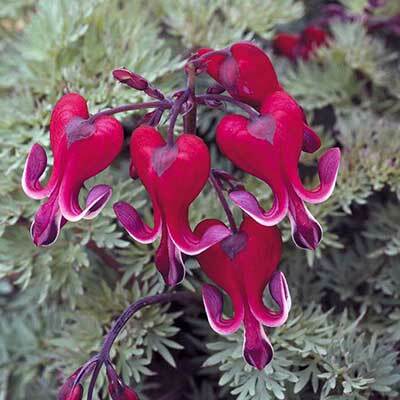 While your bleeding heart flower is a perennial, the foliage and flowers may not survive frosts. The roots will continue to survive as long as they’re protected from extreme cold. A winter mulch that’s at least 4″ deep over the root mass will provide ample warmth in cool months. As early spring approaches, thin out the mulch over the roots to allow fresh greens to spring forth. 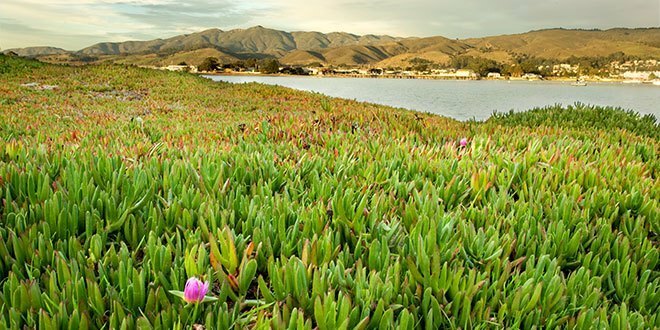 These plants love their water, and thrive in cool, moist environments. Provide a half inch to an inch of water weekly throughout the growing season. Using a drip irrigation system or soaker system allows for ground-level watering. Mulch around the base of the plant to keep the soil from drying out too fast. This is a plant which tolerates acidic mulches like pine needles. A rich organic soil is ideal. Avoid soils that will go boggy and muddy. You need good water retention, but it also needs to drain off excess water. A quality potting mix blended with compost is great! Mildly-acidic soil is acceptable. Aim for a pH range of 6.0 to 6.5. It can survive up to 7.0, but prefers less alkaline soil. Avoid pooling water at the base of your plants. They love the moisture, but they aren’t water-dwellers. Rich compost worked into the soil in the spring will provide good soil consistency. It also provides easily-absorbed nutrition for your plants. I also like to use slow-release organic fertilizers which are high in phosphorous. The added phosphorous will stimulate flower production, giving you a brilliant show! Aim for a 15-30-15 slow-release granular fertilizer in the spring. Work it in at the base of the plant so it can provide long-term feeding. If you can’t find a good 15-30-15, use a balanced fertilizer and add some bone meal to the soil. There’s many types, but I prefer fish bone meal as it breaks down consistently. You can easily grow these from seed or propagate via root division. Two times of year are optimal for dividing your plant. You can wait for the flower to die back in the fall and go dormant. Alternately, wait for the spring and the first new shoots to appear before dividing. Provide extra watering for your plants for at least two days before beginning. This makes sure the plant’s roots are easy to separate. If dividing in the fall, loosen the soil around the plant and scoop out enough to expose the side of the roots. You can use a spray bottle to rinse off excess soil to see the roots better. Pick a segment that’s 2-3″ long with at least two “eyes” or growth nodes. Use a utility knife and cleanly cut that from the rest of the plant. Fill back in the soil around the in-ground segment. Rinse off the root cutting, and prepare a pot with three parts coarse sand to one part peat. Be sure it’s well-mixed! Lay the root segment lengthwise in the pot and cover with 1″ of coarse sand. Water your potted segment when 1/2″ of the sand feels dry, and keep an eye on it. Keep it in a shady place out of the wind. Within 4-6 weeks, there should be some top growth. Repot it into regular potting soil at that time, and in the spring or the following fall, plant it out in a bed. Spring separation is easy. Again, water for a few days in advance. Gently loosen the soil and remove the entire plant once it starts to show signs of growth. Dust off or spray off the roots to get a good look. With your fingers, tease apart 6″ root segments. You should be able to do this without cutting. If the roots are very tangled, use a sterile utility knife only as needed. You can then take these segments and plant directly into prepared beds. Be sure you’ve already worked compost and fertilizer into the soil before planting. If you’re propagating from seed, it’s easiest to plant the seeds right after harvesting them. Seeds need a period of 40 degree weather for at least six weeks to propagate. They’ll get that directly in their beds. Want to wait until the spring? Place your seeds in a plastic bag with some moistened growing medium and put them in the freezer for six weeks. Once six weeks has passed, remove from the freezer and keep them in 55-60 degree temps until planting time. It takes about a month for seeds to germinate in the spring. Once they do start to germinate, you should be able to gently separate plants from the growing medium. Place them in pots and allow them to get a little larger before planting out. In fall when the plant dies back, you should see seed pods amongst the fading flowers. If you want to collect your own seeds, leave them in place until they completely dry out. The pods should be brown, with black seeds inside. I find it easiest to tie a paper bag over the seed pods while they’re drying. This ensures that if the pods split open, you don’t lose the seeds in the soil. 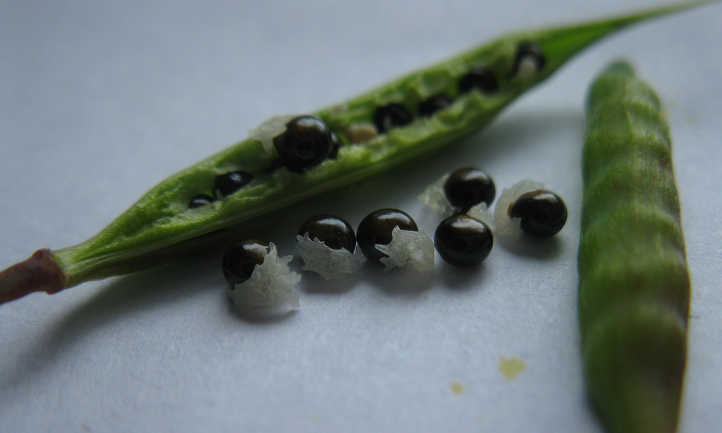 The paper allows the pods to continue to cure until the seeds are ready. Want to keep your plant large? No problem. If you’re growing in a container, you want enough space for the roots to continue growing. Repotting may occasionally be necessary. Select a container that’s 1-2″ wider than your existing pot. Prepare your preferred potting blend in advance. With care, remove your plant from its old pot. You can dust soil off the roots to check their size and confirm there’s no rot issues. Place the plant into its new soil at the same height it was planted before. Fill in the soil around the plant and water to moisten the soil completely. Then return your plant to its normal location! As the heat of the summer wears on, the flowers tend to yellow. This is just a sign it’s past its normal flowering season, so don’t panic! Once it’s completely yellowed or browned, that’s when it’s best to prune the plant. If you’re going to save seeds, you’ll need to wait until the seed pods have dried first. Aggressive pruning is best for these plants. Cut the foliage off 1-2″ above the ground once it’s completely yellowed or browned. If there’s any green foliage left, wait to prune it until later in the season. Yellowed leaves in the spring? 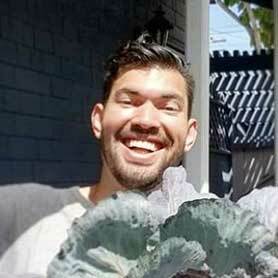 Wilting plants? Here are the most common problems you’ll face and how to combat them. 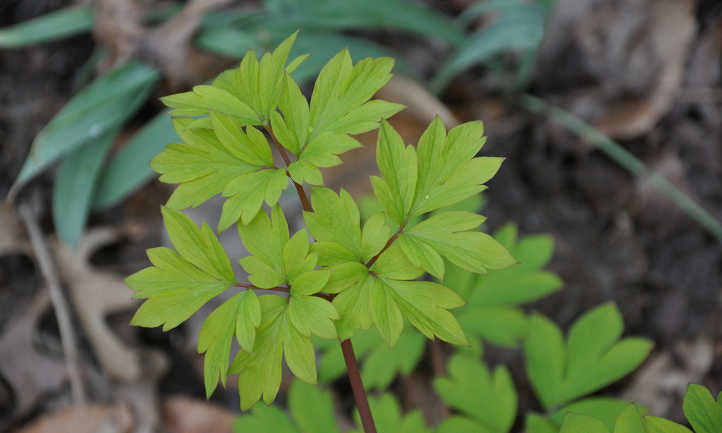 A bleeding heart plant begins to yellow once the summer heat ramps up. This is perfectly normal, as it’s a sign that it’s storing away energy for the winter. But what if it yellows in the spring? There’s a few potential issues that could be the culprit. Watering issues are usually to blame. While these plants love moist soil, standing water causes problems. The soil should drain well to prevent standing water. Limp, yellowed leaves may look like a sign of dryness but are often from overwatering. Underwatering can be a problem too! This tends to cause a complete wilting of the stems and leaves, not just yellowing. Be sure the soil remains evenly moist. Too much light can also become a problem. If your plant is in direct light for too much of the day, it can develop sunburn and turn yellow or brown. The plant is preserving its energy already, storing it away for the winter. If your plant’s receiving too much light, move it to a more shaded area when you notice the yellowing. Trees or bushes can provide dappled light to filter to the plant and prevent direct sun. Soil that’s too alkaline can also spur yellowing. Aim for a pH range of 6.0-6.5. You can use a digital pH meter to check, or send a soil sample to your local agricultural extension. Adding sulfur to the soil will increase soil alkalinity. The dreaded, deadly aphid is so common they’re called plant lice. Sometimes they’re carried in by ant farmers who’re caring for them for their honeydew. Other times, they appear on their own from who knows where! But they’re dangerous sucking pests who spread disease. Yellowing or twisting leaves, or leaves which drop off, are signs of aphid infestation. You’ll be able to easily tell as the aphids will be on the underside of the leaves. Use an insecticidal soap spray or neem oil to wipe them out. Slimy slugs and snails will snack on the foliage of your plants. These are a bit more difficult to combat as they often appear at night. By the time you get up in the morning, leaves already have been munched. Lure snails and slugs away with a good organic snail bait. This is often more appetizing to the pests than the plant itself. Once they’ve consumed the bait, they’ll become poisoned and die. Finally, while it’s less common, scale can appear. These small insects look like bumps on the stems of the plant. Like aphids, these feed on the plants by sucking the juice out of them. And also like aphids, they can cause leaf drop and twisting or yellowing. Because they hang on stubbornly, scale can be hard to combat. It will fall victim to insecticidal soaps. 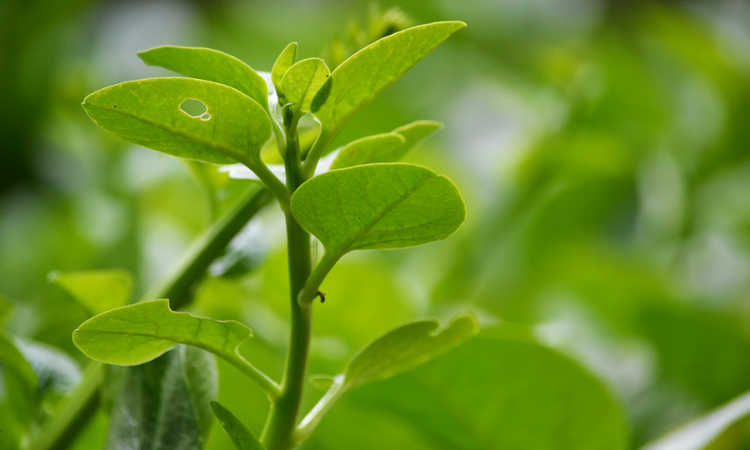 Neem oil can be used to keep scale insects at bay. Fungal infections are the most likely diseases to strike. These fungal diseases can appear on the plant’s leaves, or can strike directly at the roots. Powdery mildew on leaves can be whitish, greyish, or even faintly pink in color. It looks like a dust, but it’s actually a fungal infection. Spraying all plant surfaces with neem oil will quickly clear it up. Brown or black dots on the leaves can signal that you have a fungal leaf spot problem. The most common is alternaria leaf spot, but there’s other fungi that cause spotting too. This will gradually destroy the leaves and prevent photosynthesis. Treatment of fungal leaf spots is usually done with a copper based fungicidal spray. It may take more than one treatment before you wipe out the spotting. The gray mold known as botrytis cinerea is another problem. Plants will turn mushy or soggy, and there may be masses of gray or silvery spores visible. While copper fungicides may work, I’ve found prevention is better than curing! 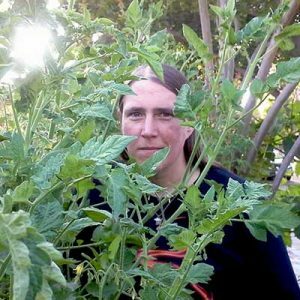 Keep plants dry to prevent fungal development. Finally, there’s a triad of fungal problems that are soilborne. Verticillium wilt is a fungal problem that strikes at the plant’s leaves and stems. 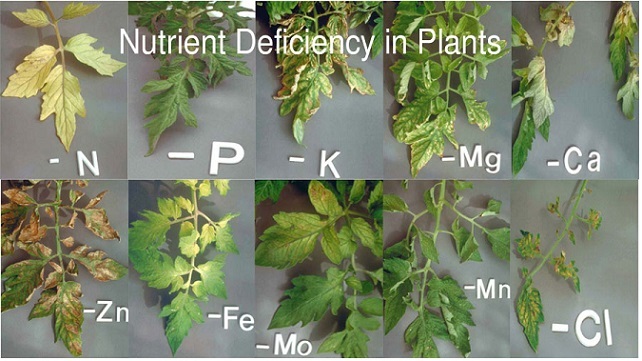 Fusarium can cause damping off in seedlings and root rot. Pythium causes roots to rot and turn to mush. All three of these fungal diseases have no real cure. Affected plants should be removed and destroyed. 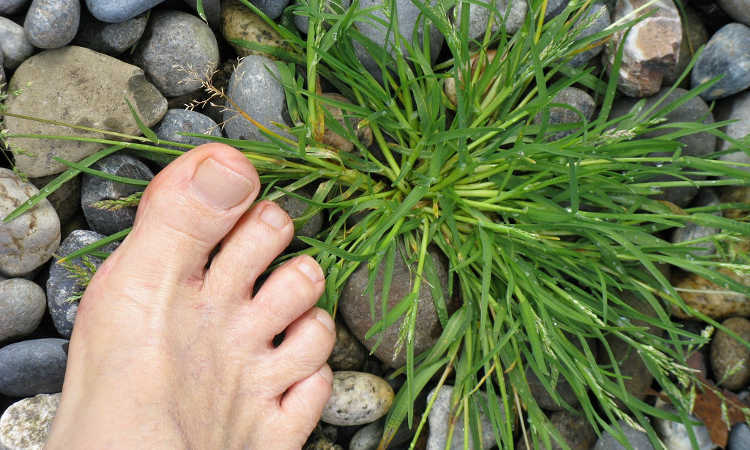 For prevention, use a product like MycoStop that protects roots from fungal disease. Healthy plants have a better chance of avoiding diseases. 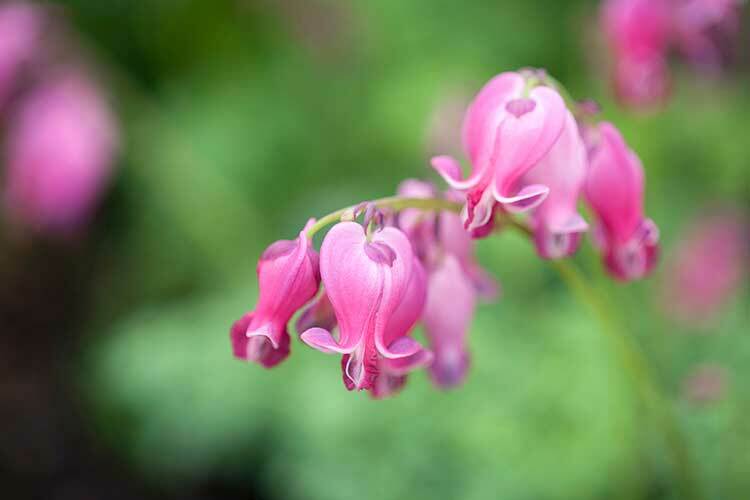 Q: Is bleeding heart a native plant? A: Well, that really depends on where you are! Some dicentra species are indigenous to the northwestern United States. Lamprocapnos spectabilis is not. It can be found wild in Japan, northern China, Siberia, and Korea. Bleeding heart plants found in the United States may be cultivated here. These plants began as imports, but are popular enough to merit local cultivation. Q: Trying to collect seeds, but paper bags aren’t working. Help? 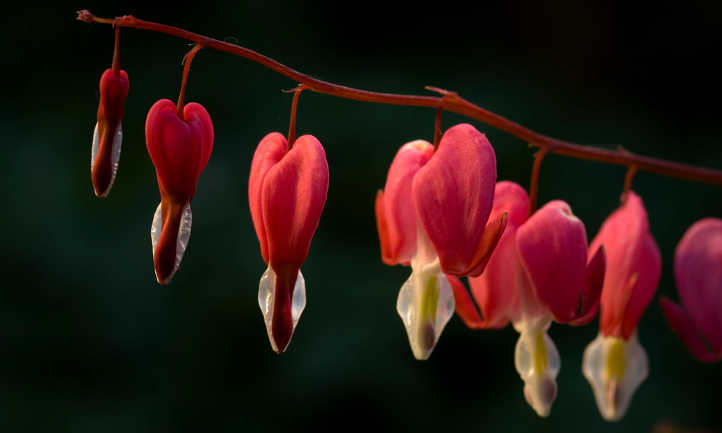 A: Bleeding heart seed pods need to completely dry on the plant. As those pods open up the minute they fully dry, this is a common issue! Your best bet is to get some form of containment overtop the pods before they can open. Paper bags breathe well, but old nylon stockings or cloth bags can also catch the tiny black seeds. Avoid plastic bags, as they prevent the pods from completely drying out and popping open. Q: Are there yellow, lavender, or blue bleeding heart flowers? 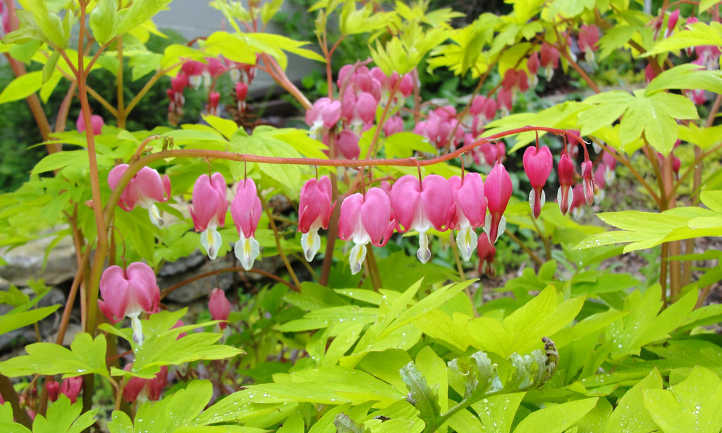 A: There’s a lot of people claiming to sell bleeding heart plants in unusual colors. But many of them are fake. 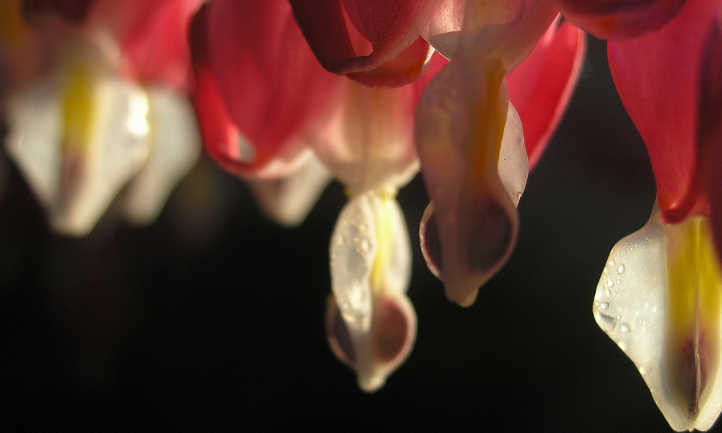 Right now, the only colors of bleeding heart flowers are red, pink, or white. Both yellow and lavender are within the realm of possibility, but aren’t available yet. It’ll take years of careful cultivation and breeding to produce those. People claiming to have blue, black, or purple bleeding heart flowers don’t, as they don’t exist. These are unfortunately scam artists, and you should avoid purchasing those seeds. 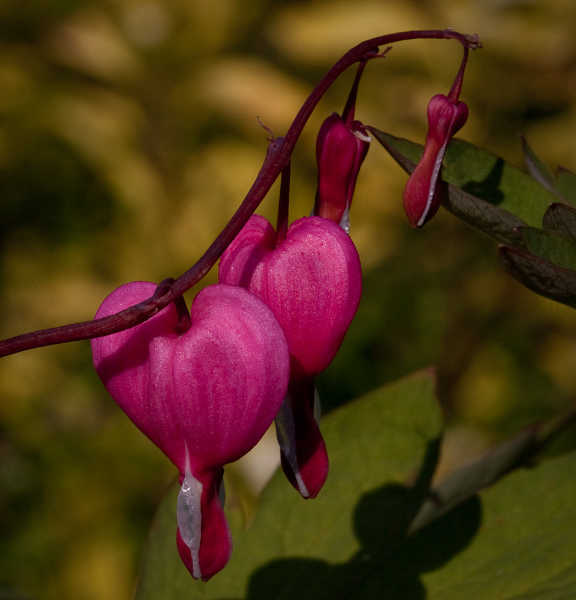 Q: Are there any good companion plants for bleeding heart plant? A: Good companion plants should fit a few criteria. They need to look good even after the bleeding hearts have yellowed in the summer. They’re also going to need to be shade-lovers, and they must tolerate moist soil. Hostas are probably the most popular choice, but many ferns will also work. I’m particularly fond of bird’s nest ferns. Brunneras can also look great with their blue flowers and white-dappled leaves. Q: What’s the meaning behind the name? A: Like so many other plants, these flowers are ascribed certain meanings. There’s quite a few variations out there! The majority of these meanings centers around love, given the flower’s shape. To some, they signify a deep and abiding love, or one which even continues after death. Others see unconditional love in their heart shaped flowers. Yet other stories are more wistful. In the Eastern cultures where these flowers grow wild, they may signify spurned or lost love. They can also signify being overly sensitive or reactive to the world around you. Their colors follow traditional flower meaning lines. White is linked to purity, while pink or red tend to be identified as love. So, is your heart full of love for these fascinating flowers yet? Mine is, and I may have to plant a few next spring! These would produce some great color spots in the shadier parts of my yard. Are there any questions that I missed answering? Let me know in the comments. It’s called the bleeding heart flower because the flower is shaped like a heart with a little droplet or teardrop shape at the bottom. Hmm…I actually don’t know! I’d guess that they’re not true to type season after season?